We’ve had our share of controversies so far in the Olympic games – Boxing, as usual, with its corrupt judges and decisions; A fencer that refuses to acknowledge the result and decision or Badminton teams getting disqualified for purposely trying to lose a match. But these things have been happening for over a century – From a marathon runner trying to cut some distance by hitching a ride or the never ending chase between dopers and Olympic testing, here are the greatest controversies in the history of the Olympic games. 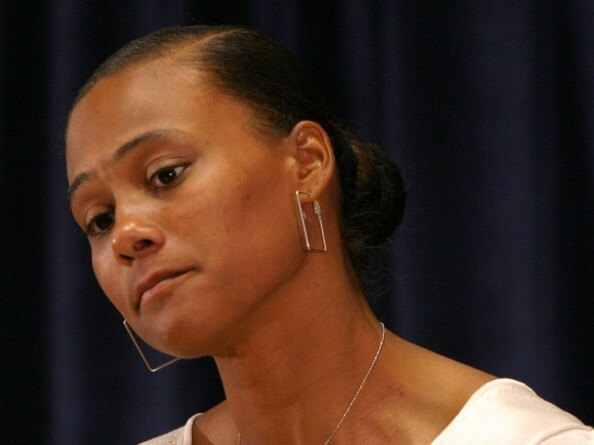 Marion Jones was supposed to be the big star of the 2000 Olympic games in Sydney, going for 5 gold medals in the 100 meters, 200 meters, 4×400 & 4×100 relays and the long jump. Jones always dodges accusations of using Performance enhancing drugs, even when her husband at the time, shot putter CJ Hunter, had tested positive for a banned steroid. 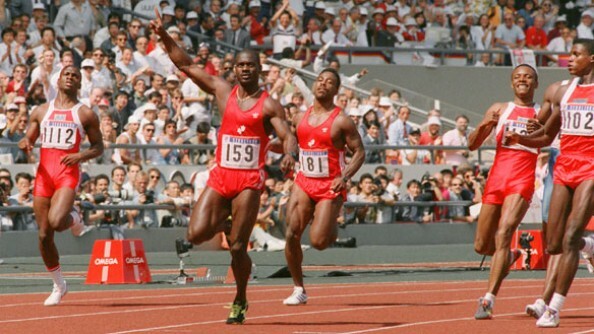 Four years later the found of BALCO, Victor Conte, told a national audience that he had personally given Jones five different illegal performance enhancing drugs before, during and after the 2000 Sydney Olympic Games. C.J. Hunter, now divorced from Jones, spoke before a grand jury and told them he saw with his own eyes Jones injecting herself in the stomach with steroids. She tested positive in 2006 but her “B” sample came back negative. Only in 2007 did Jones’ tower of cards finally collapse, admitted to lying to federal agents about her use of steroids prior to the 2000 Summer Olympics and plead guilty at the US District Court for the Southern District of New York, resulting in her medals from the Sydney Olympic games being stripped away from her, along with those from the world championships in 2001. Disonischenko, Boris the cheat. The British press had a field day with the Soviet fencer after his wrongdoings in the Montreal (1976) Olympic games, wiring his epee with a circuit-breaker so he could ‘register’ a hit whenever he wanted. A British fencer, Jim Fox, complained that he was getting points without actually being touched, and Onishchenko’s weapon was confiscated. The funny thing is after removing the wiring, he continued the match, going on to win it, before the entire Soviet team was disqualified. Roy Jones is one of the greatest pound for pound fighters of the last 25 years, but like many American fighters (Floyd Mayweather), his greatness as an amateur stood in the way of Olympic politics and what not. 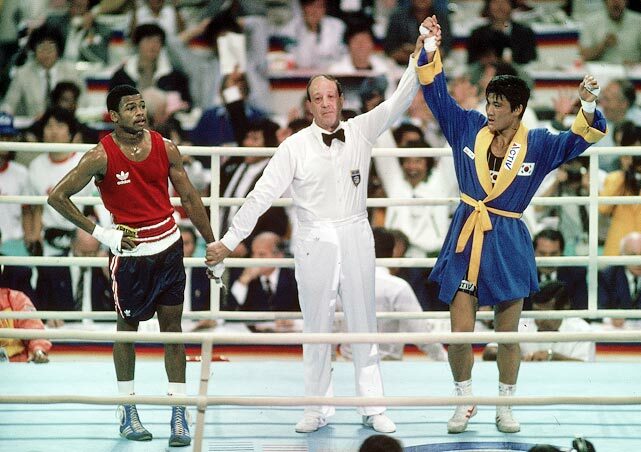 Jones destroyed the competition on his way to the final in the 1988 Olympic games in Seoul, eventually facing Park Si-hun, who mysteriously made his way to the final. Jones battered Park in the final, sending him to the canvas twice and winning the punch stats 86-32. Park, you guessed it, won by a judges decision. One of the judges, Hiouad Larbi, later admitted he awarded the fight to Park so as not to embarrass the host country. The judges who voted against Jones in the final were suspended and an investigation revealed that they were wined and dined by by South Korean officials. Jones didn’t get the Olympic gold, despite everything. 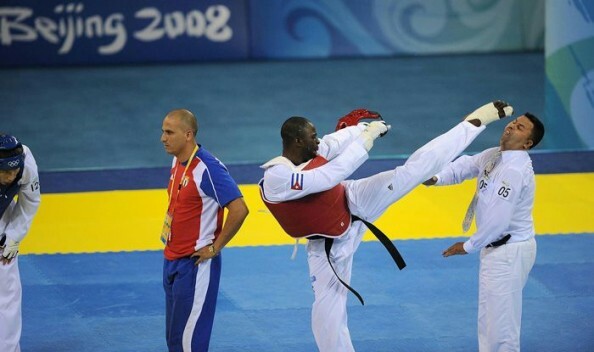 Remember the Cuban Angel Matos, who decided to go beserk in the Beijing Olympics? Matos as disqualified from his bronze medal fight with Kazakhstan’s Arman Chilmanov in the taekwondo men’s +80-kg tournament for taking too much time getting treatment on his “injured” foot. After the referee gave the fight to Chilmanov, Matos pushed the match referee and then sent a kick to the head of Swedish judge Chakir Chelbat. Responsible for one of the funniest cheating incident in Olympic games history, Lorz tried to con his way into the gold medal of the marathon in the 1904 games held in St. Louis. After nine miles, Lorz seemed to quit the race due to exhaustion, but instead hopped on to his manager’s car, took a joyride for the next eleven miles and then continued running, entering the stadium and crossing the finish line first. He almost got awarded the medal before the news of his cheating reached the right ears. The first athlete to ever be disqualified for drug abuse in the Olympic games, the Swedish pistol shooters, who won a bronze medal along with the Swedish team, was later disqualified for the alcohol in his blood. Apparently, he took a couple of beers to calm his nerves before the competition. A dumb decision by the IOC in my opinion. Maybe that kind of thinking is the reason I’m not there. Probably the most famous case of drug abuse in the Olympic games, coming in the biggest event of all, the 100 meters final. Johnson ran a 9.79 and hardly celebrated, claiming he could have run faster. He later tested positive for contained stanozolol, an illegal steroid and was stripped of his gold medal, virtually ending his career. He returned again only to be caught doping once more a few years later. 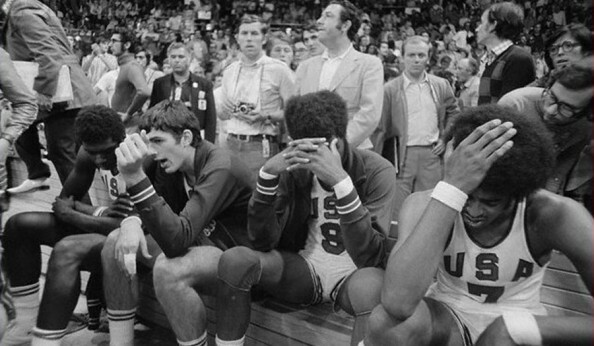 The most memorable international basketball game in history, and one of only four times in which the American didn’t get to win the gold. That was Team USA’s first ever loss in the Olympics, but it didn’t come without a huge controversy and debate, going on to this day, suggesting foul play involved. Doug Collins hit two free throws with one second left to give the USA a 50-49 lead. Then the mess began. Dr William Jones, the British secretary of FIBA intervened for some reason, sending the clock backwards to three seconds. The Soviets messed up by sending their inbound pass long, but the play and clock were reset again for some reason. On the second try, Alexander Belov hit a buzzer beating layup. The United States appealed the result, but lost it 3-2 by a jury.